I often come across heated discussions about the merits of ADDIE and using “traditional” instructional design approaches in a world of just-in-time, rapid elearning. I think these discussions are useful when they stimulate critical thinking about processes but I confess I rarely share in the emotions that these discussions seem to provoke. In my view, the approach you take is context-dependent, always subject to improvisation, and never one-size-fits-all. Models are simply that–useful ways of thinking about things, not rigid prescriptions for actions. M. David Merrill wrote an article called “A Pebble-in-the-Pond Model for Instructional Design” (Merrill, 2002). In this article, Merrill cautions against blindly following a series of steps without having a clear idea of what each step is to accomplish. At the same time Merrill urges not to throw away the baby with the bath water, acknowledging that there are some “first principles” to consider. These principles are independent of the particular technology you choose to implement instruction. According to Merrill, a learner’s experience should center around solving a problem and should involve four phases. Before you recoil in horror because this invokes Gagné and you’ve already consigned him to your rubbish bin, what Merrill describes is fairly straightforward. If there’s no relevant past experience connected to the problem, the instructor tries to find an example or context that’s relevant to the learner, i.e., some way of demonstrating that the learner will benefit from the knowledge/skills about to be imparted. The point here is to encourage learners to start to organize the knowledge they’re going to gain using their own relevant frameworks. Does the courseware demonstrate what is to be learned rather than merely telling information about what is to be learned? Are the demonstrations consistent with the instructional goals? Is learner guidance employed? Do [the] media enhance learning? These questions acknowledge the importance of experiential design based on a foundation of learning cues provided by the instructor. It’s important for the learner to practice skills that are relevant to solving the real-world problem the learner is faced with. Merrill urges providing “a varied sequence of problems” with the instructor providing the learner with less and less guidance as knowledge/skills are acquired. Though this may put you in mind of Gagné again, this is a worthwhile phase to retain. Essentially, the instructor should include aids or techniques that encourage transfer of learning to the job. Transfer is enhanced when learners actively reflect on what they’ve learned and adapt their knowledge/skills to their own personal work challenges. With these “first principles” in mind, Merrill’s proposed design approach is illustrated below. Although Merrill describes the model as “content-centered,” it presumes that performance analysis and task analysis have already taken place and that these are not steps to be skipped. The focus is always on that first “pebble” creating the design ripples, i.e., the core real-world problem the learner will learn how to solve. As implemented, the learner proceeds through each problem before tackling the next problem since problems build on one another. In solving earlier problems the learner acquires the necessary knowledge/skills to progress to the next problem. Although this approach may not seem that earthshaking, it’s worth keeping in mind as we turn increasingly to experiential learning designs. Placing the learner in a simulation or scenario that mimics his/her real-world environment is a great way to demonstrate relevance and to challenge and engage a learner. But scaffolding is as important in designing experiences as it is in more traditional types of learning. The instructor’s role is to provide the right flotation devices at the right time. Merrill, M. D. (2002). A pebble-in-the-pond model for instructional design. Performance Improvement, 41(7), 39-44. 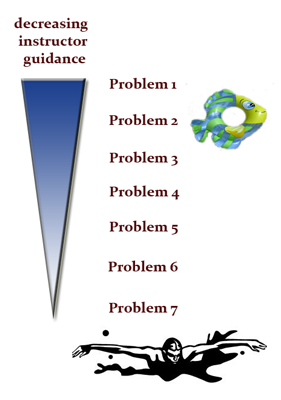 This entry was posted in instructional design approaches and tagged elearning, experiential learning, instructional design, Merrill, pebble in a pond, problem-based learning, problem-solving, rapid elearning, web2.0. Bookmark the permalink.